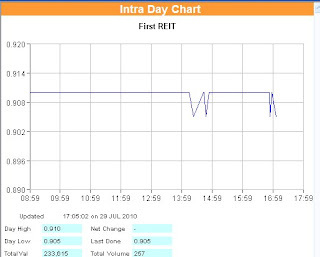 First REIT triggered today at $0.91 and have been hovering around the 0.905-0.91 the whole day. Seller queuing to sell at 0.91 and buyer waiting to buy at 0.905. 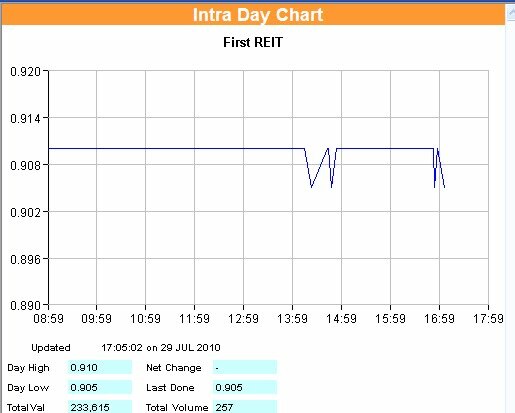 At 4+pm, I wanted to buy this stock, there is only 2 choice, either I buy at a higher price 0.91 or I queue up obediently on 0.905. Since the price is only hovering between the 2 price, I believe it is not possible to break 0.91 in the last min. Decided to grab it during share matching time (5.00-5.05pm). Reason being, the share will either close 0.91 or 0.905 depend on which ever side is more desperate(seller or buyer). So what I do is 1) wait till 5.04pm to key in order, 2)key in at a higher price. As a result, when poems matches the share, and decided the closing price to be 0.905(more desperate seller). I will hence be the first few to buy as I have key in the higher price. What ever orders came in after 5pm will be executed on this agreed price, those who queue at 0.905 will have to queue behind me. if you submit too late. 4) etc.... its a trail and error thing..